Friday, July 13, 2018? 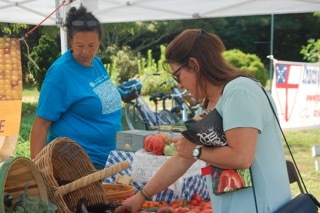 A lucky day for those who happened by the Charlestown Land Trust Farmers’ Market! Sunny skies prevailed, and the mood of our shoppers as they streamed onto the shopping green was just as sunny. 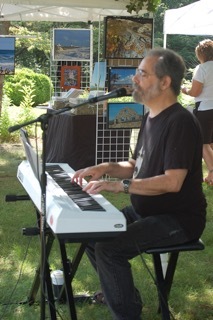 Chris Fee played keyboard from the start of the day until the market closed at 1 – and what a selection of music he chose! If you were to drive by our market on any given Friday, your eye might be caught by the LINE of people leading to the Great Harvest table with its wide selection of bakery goods. Whole grain breads, cinnamon buns, muffins, fruit squares and cookies – all made fresh locally-and offered with a warm smile each week from Blessing, Great Harvest’s new sales person at our market! 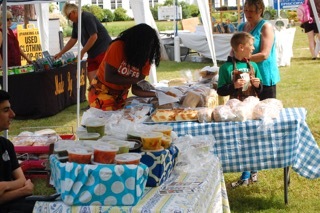 There’s more than food at our market – fresh and delectable though it may be. A relative newcomer to us here in Charlestown, but not to the business she runs, is Jackie Smiley of Jackie’s Herbals. 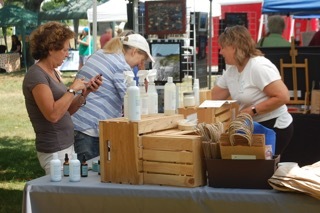 Her handmade creams, sprays and lotions contain locally sourced ingredients that soften, heal, and protect. Stop by to learn more from Jackie herself! 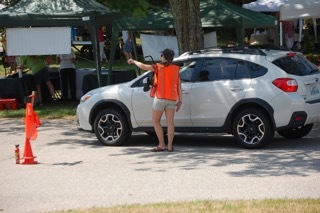 A stop at the Charlestown Land Trust Market table any week results in warm greetings, an opportunity to purchase shopping bags, transformed from previous uses by Sue Tremblay….and just right for use at our market…or elsewhere. But a stop at the market table also yields information about the Charlestown Land Trust itself and ways to protect this rural, coastal, picturesque corner of the RI. You might just decide to attend our CLT Summer Party and Auction on Thurs., July 26th….It will be FUN! Just two booths over from the Market Table, Audrey of Audrey’s Creations, engages with customers who look for her unique, hand crafted jewelry. Some incorporate beach finds, others reflect light….Each piece has its own beauty. 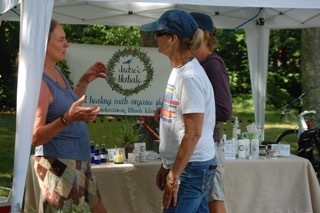 Heading back to the promise of FOOD, stop by at Narragansett Farm. Choose from fresh produce (eggplant already!) and ask about the farm where the vegetables are grown. You might also want to learn about the Narragansett Food Sovereignty Initiative. To round out the morning, take a stroll over to Pure Haven Essentials. Over the past few years shoppers have learned to value this line of products – from lip balm to creams to an array of personal care items – made with natural ingredients and absolutely NO harmful chemicals. Talk with Diane to learn more. 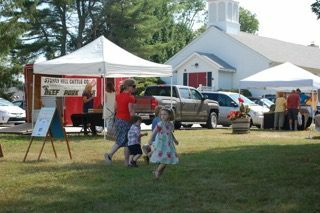 Along with our Farmers’ Market which does business OUTSIDE, The Church of the Holy Spirit (the ones who welcome our CLT Market each summer season) held their annual Rummage Sale INSIDE the Church. That meant there were a LOT of cars in the parking lot. Weren’t we fortunate to have parking attendants with panache? Coming this Friday, July 20th? 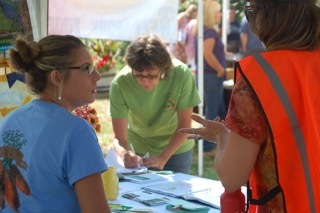 Look for URI Master Gardeners with their soil testing advice and other tips about gardening in Southern RI. And if you’ve never had the experience of visiting ReStore located at the north end of town, stop at their table. ReStore carries any number of home improvement items from used appliances to second hand pots and pans. Proceeds benefit Habitat for Humanity, with several active chapters in RI. On deck for music is Paula Clare, a treat for sure. We look forward to having you join us!